Home / Sharpening Articles / Sharpening FAQs / Wet Stone or Whetstone? Is it Properly Called a Wet Stone or a Whetstone? I heard this called a "wet stone" but I thought it used oil. Should I use oil or water on it? The instructor said I need a "wet stone" what should I get? Are water stones and "wet stones" the same thing? These questions arise because the words "wet" and "whet" sound alike. However they are actually different, and this is a common source of confusion. 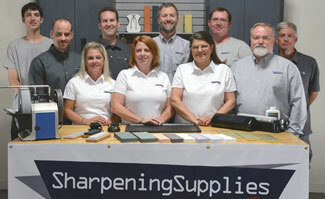 When used about sharpening stones, the proper word is actually whet. It is a bit old fashioned now, but the process of sharpening used to be called "whetting", so to sharpen a blade was to "whet" it. Any stone used for sharpening was therefore called a "whetstone". The terms "sharpening stone" or "honing stone" have largely replaced whetstone these days, but you will still hear it used occasionally. Technically, the name whetstone can be applied to any form of sharpening stone, regardless of what cutting fluid is typically used with it. However because whet sounds like wet, many hear the word and assume that it refers to a stone that is used wet with water. Actually, water stones, oil stones diamond stones and ceramic stones are all forms of whetstones. So, while all water stones are whetstones, not all whetstones are water stones. Just to prove that we're not merely sharpening geeks, here's an interesting side note. The word whet pops up in some unexpected places. A small species of owl is called the saw-whet owl because the sound it makes reminded people of the sound made when sharpening a saw with a file. And the phrase "to whet your appetite" comes from the idea of your hunger growing sharper at the thought of food. Should I Use My Sharpening Stones Wet or Dry?